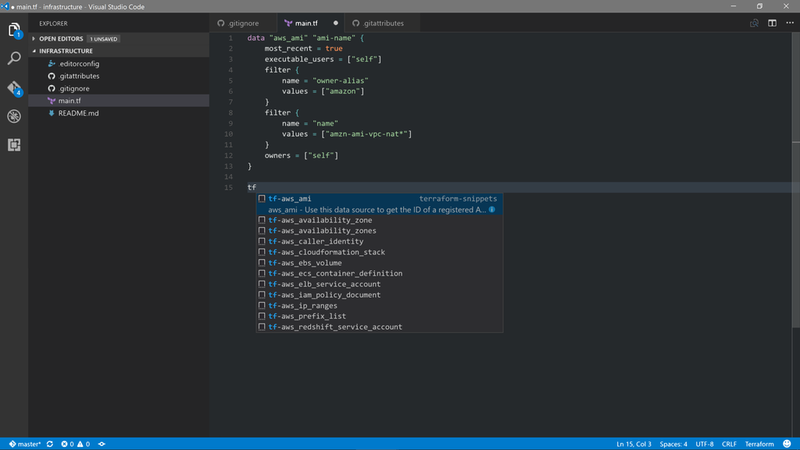 Visual Studio Code>Snippets>Advanced Terraform Snippets GeneratorNew to Visual Studio Code? Get it now. Provides 550+ code snippets of Hashicorp's Terraform cloud orchestration tool. I'm looking for volunteers to help me maintain this project. I don't have enough time to do some of the work. Provides 550+ code snippets of Hashicorp's Terraform cloud orchestration tool for Visual Studio Code. Install the Terraform Language support extension from the marketplace published by "Mikael Olenfalk"
Generates a single file in "snippets/terraform.json" from "src/" snippets file. It is super easy, the snippets for each Terraform features are self-contained into its own single JSON file. Microsoft Azure (Legacy ASM) is not included in this release due to inactivity of development.